The basic elements of MOVEMENT, PATTERN, RHTYTHM, REPETITION, TEXTURE, LINE, COLOR and SHAPE all apply to these woven and dyed African fabric samples. The samples are from different areas and tribes of Africa. Please note that there is not time to show and discuss more than about six to eight of these pictures in a presentation. There are many prints so that everyone has a chance to choose the examples that they like the most and that they feel are the best examples for the EALRS (types of patterns, types of colors, type of weavings, etc.) that they want to focus on. GEOMETRIC, ORGANIC and FREEFORM SHAPE is abundant in these woven textile PATTERN examples. BASIC LINE TYPES—horizontal, vertical, diagonal, zigzag) are easy to find. Curved LINE can be found in the PATTERN of Man’s embroidered drawstring Trousers and Man’s embroidered Gown. Most of the textiles are examples of ASYMMETRICAL BALANCE. Adire Cloth 2 (plate 5} has SYMMETRICAL BALANCE, the design PATTERN is mirrored on each side of the cloth. Classes should pick out PATTERNS in these textile pictures. PATTERN has some sort of REPETITION in SHAPE, LINE, or COLOR, or with any combination of these elements. Some Patterns REPEAT (Adire Cloth 1). Most textile Patterns in the packet ALTERNATE. Point out how thin strips of cloth are sewn together, which also affects the PATTERN design. Talk about TEXTURE—Use fabric samples the kids can feel. An example for rougher Raffia Cloth could be burlap. Examples of cotton cloth with a thinner and a thicker weave could demonstrate how the same material might have a different texture. Silk definitely has its own texture. Cut pile could be demonstrated using velveteen, corduroy or terry cloth. Be sure ALL 16 pictures are returned to the Packet Carrier after your Presentation is finished. In Africa, textiles have been and are still being used for many things such as grave cloths, wall hangings, masquerade costumes, bed covers, tent awnings, and, historically as armor and currency. Textile is another word for cloth. In Africa, a large collection of fine cloth may be seen as an indication of the owner’s wealth and social standing. The earliest known fragments of cloth came from sites at Igbo Ukwu in Nigeria, dating back as far as the 800’s AD. Cloth fragments from Benin City, also in Nigeria, date from the thirteenth century AD. Fragments found in the Tellem caves, in Mali, date to the twelfth century AD. Early accounts by Arab travelers and, after the sixteenth century, by Europeans on the West African Coast frequently mention narrow strips of cloth, particularly as a medium for trade (used as money or currency). Why weave narrow strips? Nobody really knows, although there are a number of possible explanations. Wheels of narrow strip cloth made good items of trade because customers could sew together as many strips as they wished to suit their own particular needs. Strips were also easy to transport. It was much easier to maintain the quality of the cloth in smaller strips, which could be rolled, than in large pieces that would need to be folded. There are many types of African cloth in which the decorative PATTERN design depends on a number of individual strips, placed side by side. Men do almost all narrow-strip weaving. These narrow strips of cloth are usually traded or sold. Women weave only the wider pieces of cloth, which are used in their own homes and for their own families. Locally produced fibers, which are spun into yarn, include cotton, silk, goat hair and wool. Woven cloth is also produced from non-spun natural fibers, such as Raffia, which is obtained from the stems of certain plants. The yarn produced from hand-spun, local materials is thick and hard to work with. Because of this, the parts of Africa that first had contact with Europe have a long history of using imported European silk and cotton yarn. Today, many new types of synthetic yarn are available. Locally produced African silk yarn is woven into a beige colored cloth, which is highly prized by the Yoruba peoples. The Yoruba name for this cloth is Sanyan (shahn yahn). The Malagasy people prefer to use silk cloth to make their tribal burial shrouds. A burial shroud is a cloth covering that is wrapped around a deceased person to show respect when they are buried. In the past, natural dyes—such as black or brown from river mud, red from camwood, yellow from brimstone bark, and most important of all, indigo blue from the indigo plant—were the only choices for color that could be found in Africa. Today, there is quite a range of imported synthetic dyes, which greatly vary the TINTS and SHADES of traditional colors. All of the pictures in this packet are examples of African textiles. All cloth is woven in some way and all weaving is done on a loom. Looms can be made of many things. Straws, cardboard, wood, branches and even your fingers can serve as a loom. Pieces of string or yarn go over and under the pieces of string or yarn attached to the loom. Big electric looms make the cloth we have today but much of the cloth in Africa is done on handlooms. The African men weave the cloth sold to the public. People buy as many strips as they need and sew them together to make clothing or blankets. Weavers can create interesting designs by changing the color of string or yarn they are using. This can create many different PATTERNS. The designs on African cloth are handed down from father to son. The women also create patterns on cloth using embroidery, appliqué, patchwork, dye resists or block printing. PATTERN is repetition of line, shape and or color. There are many kinds of patterns in this packet. • Random Pattern is a scattered pattern like raindrops on a dry pavement, freckles, ice crystals or snowflakes on a windowpane. • Geometric Pattern looks like lined notebook paper, a chain link fence, keys on a piano, a checkerboard. Patterns created using geometric shapes—lines, rectangles, squares, triangles, circles, ovals, etc. • Color Pattern—repeating color can create a pattern. • Shape Pattern—repeating or alternating ORGANIC, GEOMETRIC, or FREEFORM shapes. Most of these textiles have combined aspects of color, line and shape in the pattern repetition. • Design a stamp with clay, emphasizing raised or recessed designs. 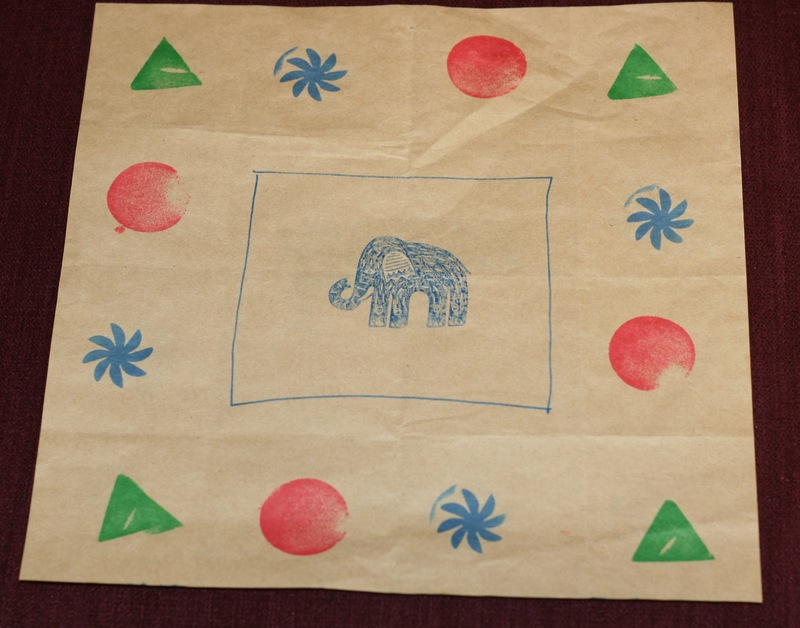 Use the stamp in a tray of paint, to print a design on a square of muslin. Design different patterns by sharing different stamps with other kids in the class. 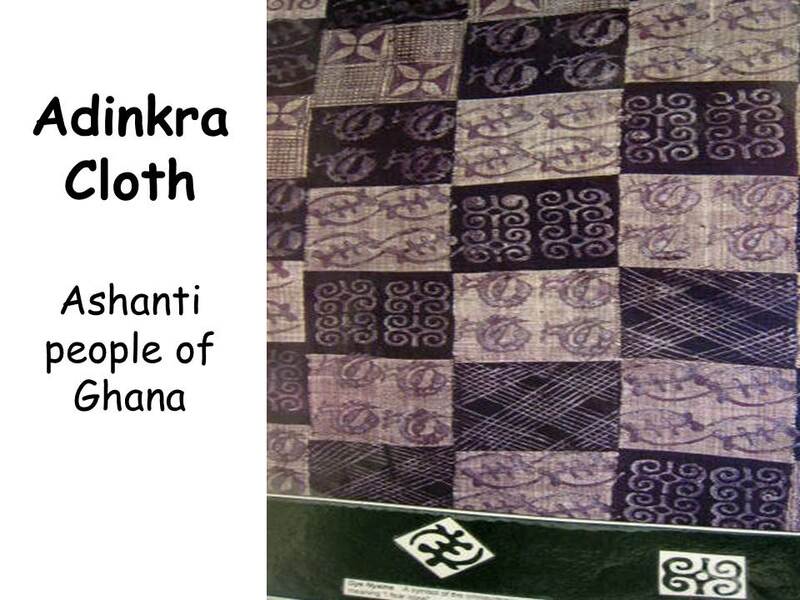 This represents Adinkra cloth from Ghana, with a pattern stamped on it. • Tag board is great for kids to cut stencils of the real Adinkra designs. They could each cut one stencil and share these stencils so everyone can have several patterns for their finished cloth or construction paper designs. Cloth does not have to be used for the projects in this packet. Construction paper works fine—especially the larger sheets. Cloth just gives the kids a chance to try another medium and, if your school has an Art Discovery budget, you can get muslin or old sheets cheap. You might even find parents in the school willing to donate plain fabric or sheeting. 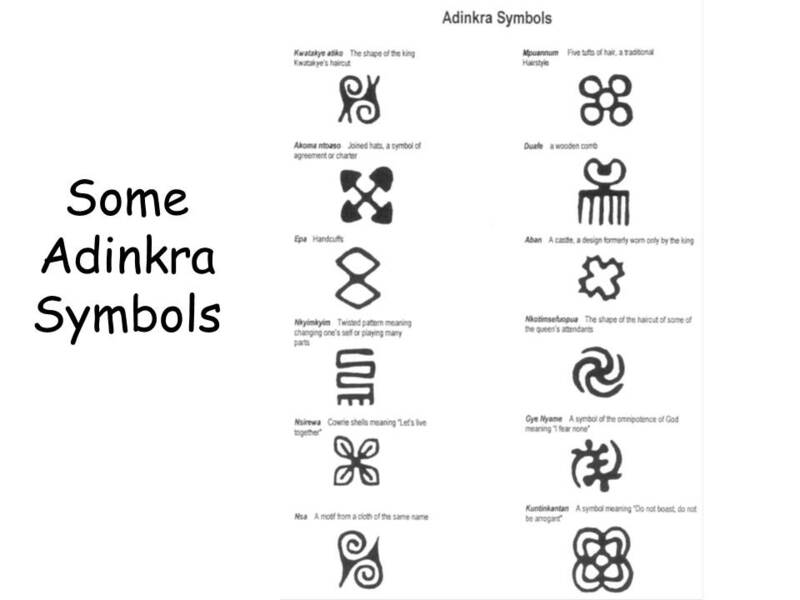 Creating and sharing stamps for an Adinkra cloth design would be great! Each square usually has a different pattern. 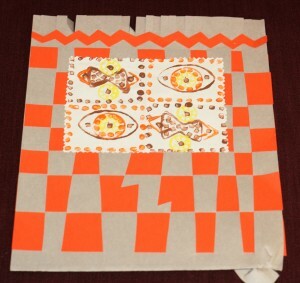 • Stamps may also be made using pieces of a Styrofoam cup, gluing to a corrugated cardboard backing. 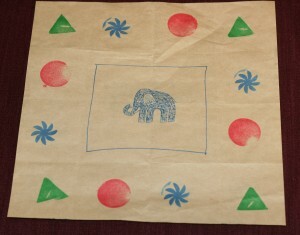 • Heavy yarn, dipped in Elmer’s glue, then laid on corrugated cardboard, can make a nice stamp design. This needs to dry for quite awhile, before it can be used in paint. The project may take one session for the stamp and another to create the cloth. • Stamps can be created with foam sheets cut into shapes. They can be mounted on a block or stacked with a second layer of foam. Some foam comes with a sticky back. Check craft stores. • Half of a potato can be cut into a stamp design. • Create a weaving project using twig branches. Collect several short branches with V sections. Weave colorful yarn, of different thickness and colors, between the branches to make a pattern. • Create spiral weavings using a 6” notched circle. Mark an odd number of evenly spaced slits around the circle’s edge. Cut small, notched slits with scissors to create a cardboard circle loom. Tie a knot in a long piece of heavy string or yarn and insert the end of this into one of the slits. This makes your WARP. Wind the yard across the loom’s center, dividing it into triangle sections. Keep the tension tight but not tight enough to bend the cardboard. End by tying a knot in the center, where all the strings cross, and snipping off the extra yarn. Choose a second color of yarn. Thread this onto a baby pin loop. This yarn will be your WEFT. Beginning in the center, sew over and under the WARP threads. Pull the rows of yarn close together, as you circle around. The Nigerian Adire (ah deer reh) cloth is a cotton fabric that is dyed indigo (deep blue). It is often worn by women at the market or while they are doing daily domestic chores. 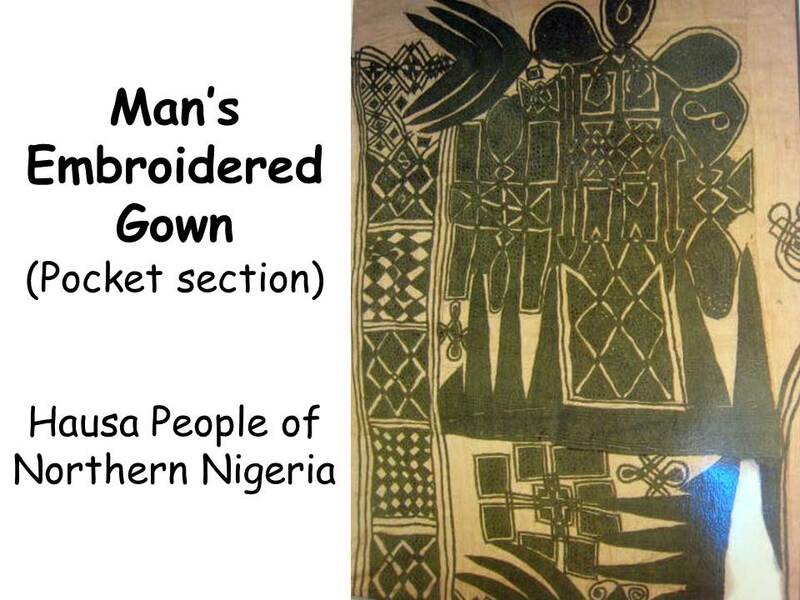 The Yoruba people originally made and named this type of cloth, but many other groups now create this cloth. Today, any cloth created using a resist or stitched method, by all ethnic groups, is commonly called Adire. Cloth is dyed with indigo (called “adire”), a dye made from the chopped and pounded leaves of the African indigo plant. The cloth takes on a brown color, which immediately oxidizes with the air and becomes a beautiful deep blue color. Using a “resist” process, patterns are created using tin stencils or freehand drawing, on cotton fabric, with Cassava paste. Cassava is the root of a tropical plant that is ground up to make a nutritious starch. Tapioca pudding is made from Cassava. When Cassava is painted on cotton fabric, the design under the paste resists the dark blue indigo dye. Once the dye has been applied to the fabric, it is rinsed several times, to be sure the dye has set and to remove the Cassava paste. Adire cloth created this way is called adire eleko. 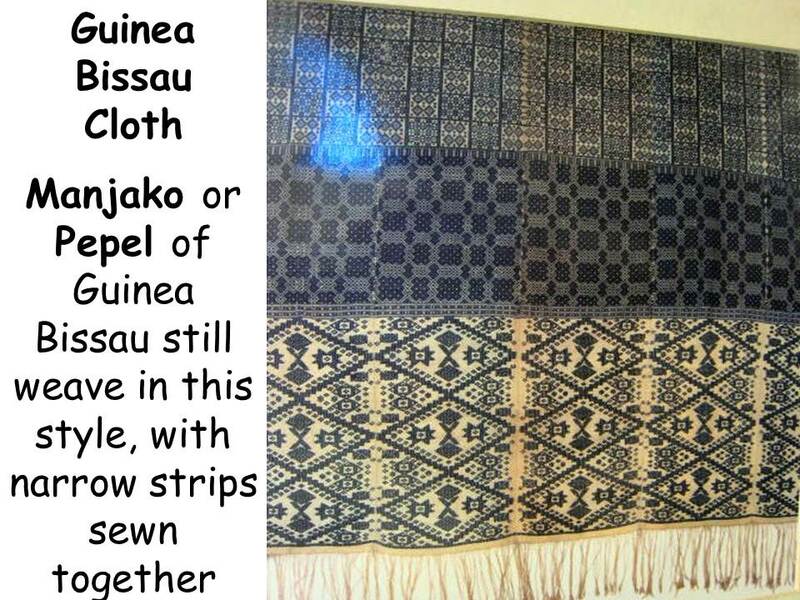 Adire Eleso is the name for Adire cloth produced using a resist method supplied by raffia fiber stitching. It is similar to the tie-dye method used by people today. The starch resist method (adire eleko) has the design on only one side of the fabric—the side the Cassava paste was painted on. The stitched resist method (adire eleso) shows the pattern on both sides. Sometimes legends are illustrated on Adire cloth, other times the patterns are commemorative images of leaders, political slogans, or simple geometric designs. Rolling the cloth and stitching raffia thread through the folds, before dyeing in indigo, creates a pattern like this. The remains of the raffia stitches are still visible on the cloth. 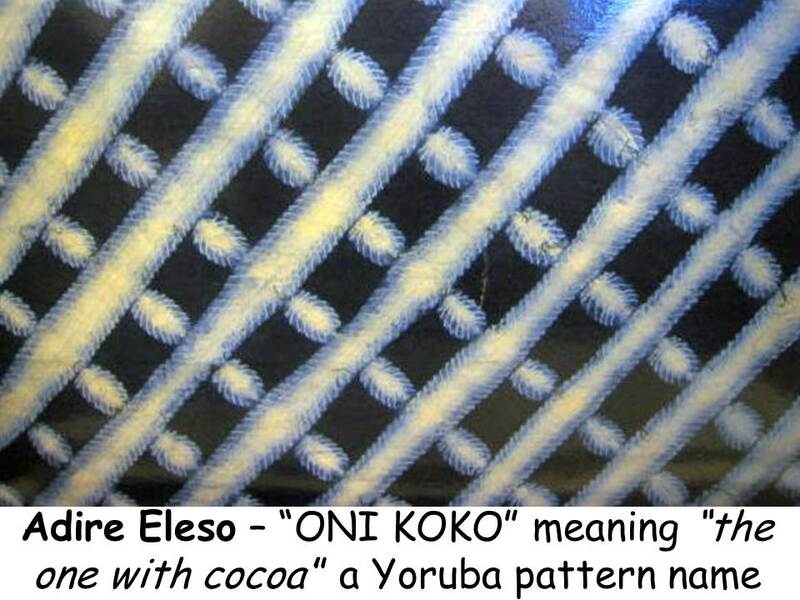 The design is known as oni koko, ‘the one with cocoa’, and gets its name from the similarity of the small oval pattern SHAPES that resemble cocoa pods. To create this design, rows of small stones (called eleso) are tied off with raffia. This method creates a more dramatic difference between the dyed portions and the resist portions and is a method used in the African countries of Nigeria, Togo and Ghana. 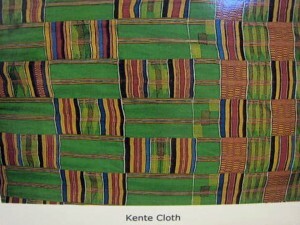 Compare this adire cloth with the other two examples. 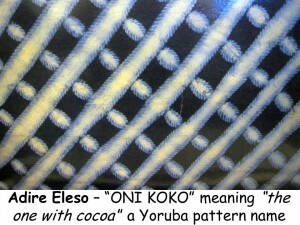 The Adire Eleso pattern is seen on BOTH sides of the fabric. Do you notice how much lighter the pattern is compared to the background? 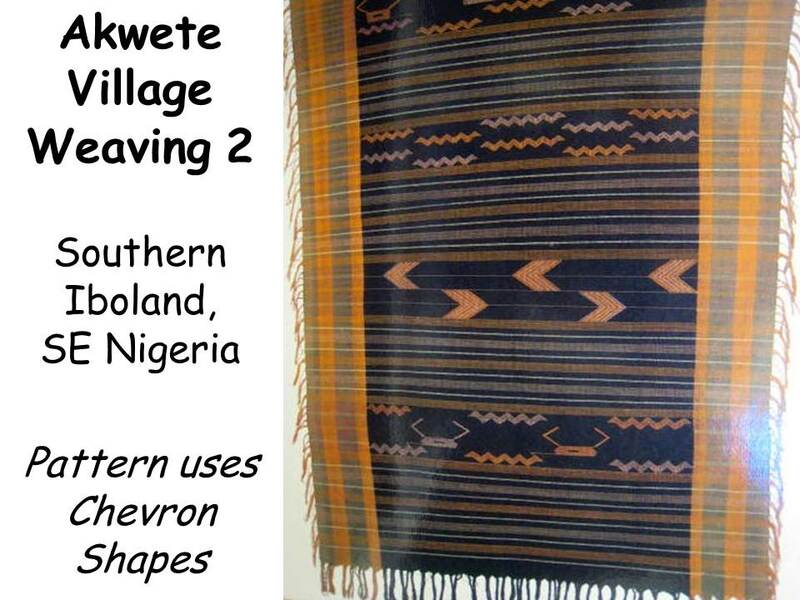 How does this compare with the other two adire cloth examples? • A solid color sheet, cut into squares or rectangles, will provide inexpensive cloth for this project. White works well but any solid color will work. Use several tiny orthodontic rubber bands to wrap along the length of the folded or rolled fabric for this pattern. Use the rubber bands to tie rows of small seeds or stones, to create an oni koko PATTERN. Use a dark prepared commercial dye to dip your fabric into, but indigo blue (blue jean blue) is the most authentic. • Make a tie-dye cloth by rolling the fabric and stitching the folds before dipping in dye. Gather the stitching. Smaller or larger stitches can change the design. The cloth can be rolled or folded in a fan shape. Each way creates a different pattern. 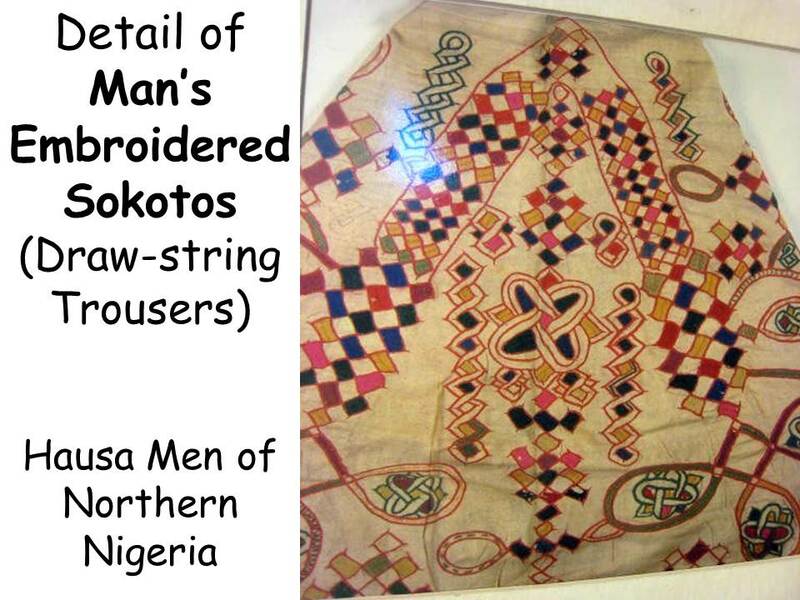 This Yoruba cloth was created in Abeokuta town, Nigeria. The design is done with the starch resist method (adire eleko). A stencil was used for this design. 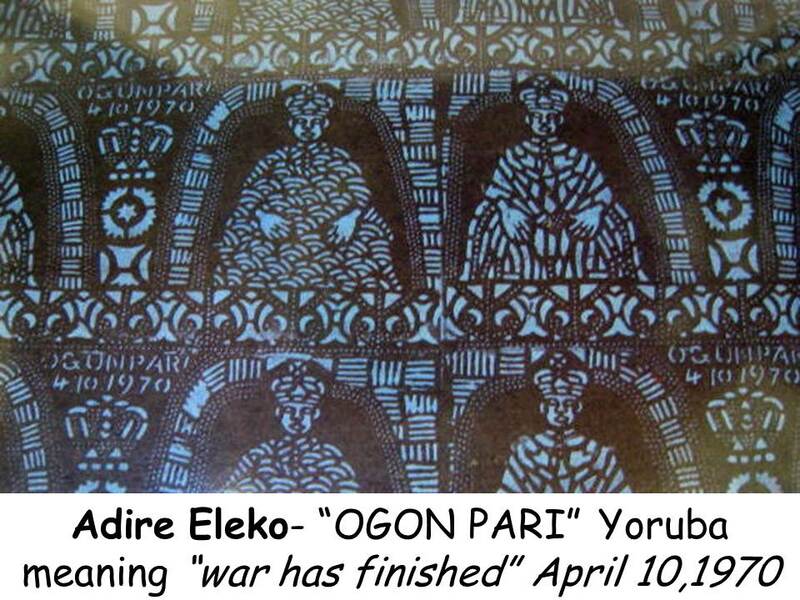 The words ‘ogun pari’ in Yoruba mean ‘war has finished’. They refer to the end of the Nigerian Civil War. Although the official cease-fire was in January 1970, the date 4. 10. 1970 may commemorate the announcement by General Gowon of the nine tasks to be achieved before handing over to a civilian government. The image of the king is from an earlier cloth that commemorated the installation of the new Alke of Abeokuta in the 1960’s. This design was probably a banner. • Create a banner using an important date in your life and draw a picture to commemorate what this date means. Important dates could include birthday, the first day of school, the last day of school, losing a first tooth, a broken arm (or leg), learning to ride a bike, etc. Select a phrase to use on the banner, to commemorate the event, such as “Another Year Wiser”, “A new door opens”, “Climb the Next Step”, “Toothless at Five”, “A Skill Perfected”—etc. • Create repeated pattern designs using a self-created stencil. This Yoruba cloth was created in Nigeria. 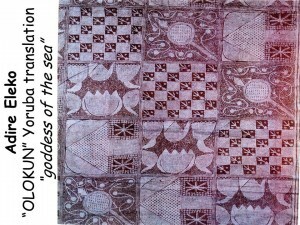 This (adire eleko) design was painted freehand on the cloth with Cassava paste to resist the indigo dye. 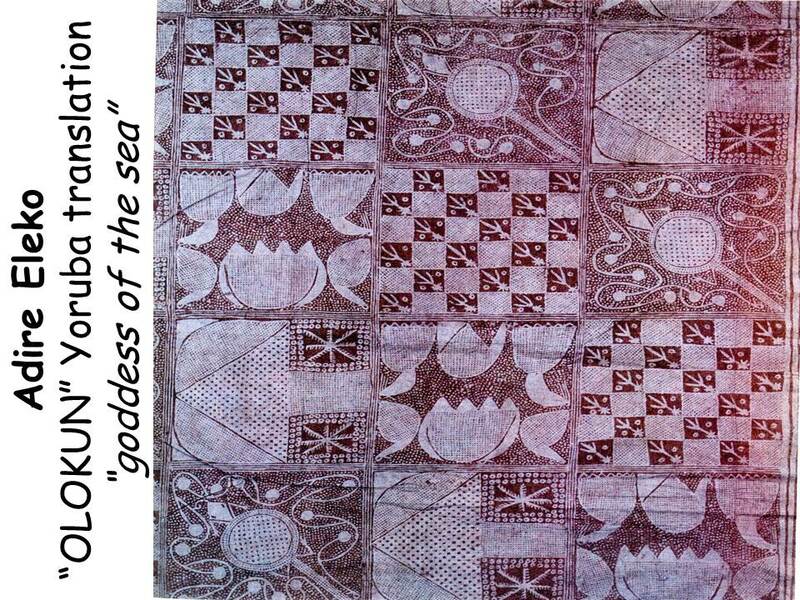 The design is called olokun, literally “goddess of the sea”, but by association has come to mean, “life is sweet” (wealth comes from overseas, wealth makes life sweet). All three Adire designs (Plates 5-7) were created in different ways. This design was painted freehand, Plate 5 used a stencil, and Plate 7 was folded and stitched with raffia thread to create the design. Explain these different techniques. • Create designs on cloth using thick white glue. This will need to sit overnight to completely dry. The next day, kids can paint their cloth. After the cloth has dried, peel off the glue. The fabric under the glue will resist the color. In Yoruba, “Egungun” means, “masquerade”. Egungun are annual masquerade festivals that honor ancestral spirits. 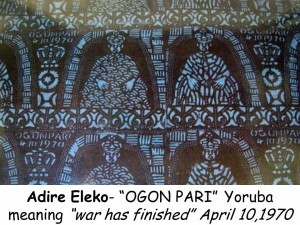 In Yoruba culture, ancestors are believed to be departed but not dead. The spirits of departed ancestors constantly influence the lives of the living by giving guidance and support when needed. These festivals are celebrated throughout Yoruba culture during the Nigerian dry season, which is December through March. The festival varies from town to town, depending on the ancestral history of each place. If a town has a strong military history, the Egungun honored may be warrior spirits. The drumming and dancing would probably be very aggressive and chaotic, to reflect the warlike nature of the local ancestors. Costumes also vary greatly. They range from fantastic animal masks to spectacular costumes made of highly patterned cloth. Each Egungun costume covers the entire body of the masquerader because the ancestral spirit is believed to enter the dancers and their costumes. The Yoruba believe the ancestral spirit must be concealed inside the cloth because it is too sacred to be touched. Egungun masqueraders often use cloth to transform themselves from one spirit into another by changing the color and shape of the cloth while the Egungun whirls around. Cloth is important in all Yoruba ritual. During Egungun, people “sacrifice” cloth to ancestors by placing it on shrines as a gift. Thankful mothers offer their cloth as a sacred gift to ancestral spirits. In the rainy season, a festival called Gelede is held. Gelede honors the power of women through masked dances. Gelede dancers wear elaborately carved wooden headdresses, decorated with groups of figures, to represent an historical event, a moral statement or even poke fun at a local incident. Cloth also plays a significant role during Gelede. Before they perform, the male dancers borrow cloth from women and use it in their costumes. The masqueraders collect the strips of cloth the day before the dance. Because of this, Gelede performers are often called “day borrowers of cloth”. The possession of cloth is equated with wealth and is considered a “sacrifice” when given away. This cloth is from the village of Akwete, in southern Iboland, in SE Nigeria. Only women produce Akwete weaving. In most African cultures, the men produce all the weaving that is traded and the women only produce what their family will use. 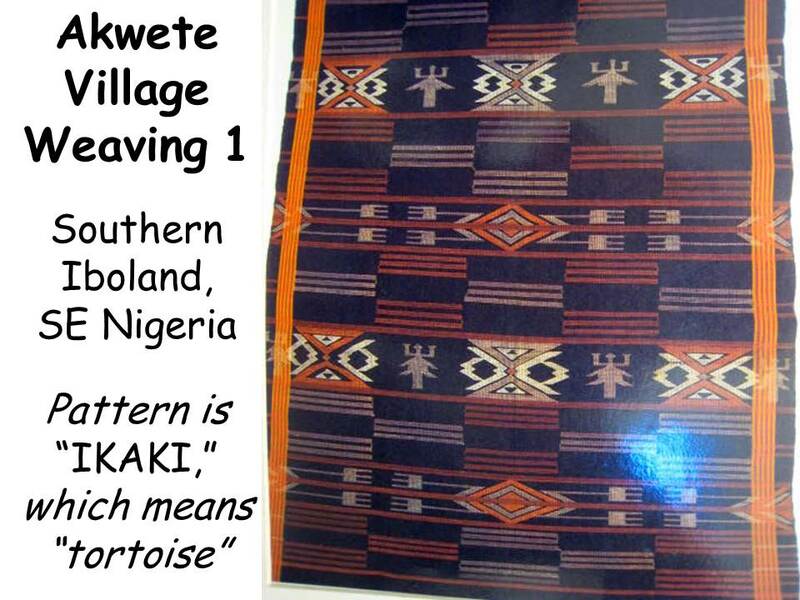 The Akwete people traditionally traded this type of cloth, which is unusual because women weave it. This design is known as ikaki, which means “tortoise”. The tortoise shell can be seen in the diamond pattern in the center of two of the HORIZONTAL bands of the cloth. Two of his long skinny legs and funny feet (with three-prong toes) stretch out in front and in back. The tortoise was considered wise and cunning. He was important enough to be associated with kings and chiefs. There are many patterns in this cloth. What type of SHAPE do you see mostly? GEOMETRIC rectangles, but the turtle is an abstract ORGANIC SHAPE pattern motif. The artist created a stylized tortoise (Expressionistic). It looks like these shapes have heads and arms stretched up, with something projecting from their sides. • Design a geometric animal, similar to the designs on this cloth, by coloring on graph paper. The animal could be real or imagined (an abstract design). This cotton cloth was woven on an upright loom in Akwete, SE Nigeria. This upright loom creates a wider piece of cloth than the horizontal loom, used by men. Women create the Akwete cloth. 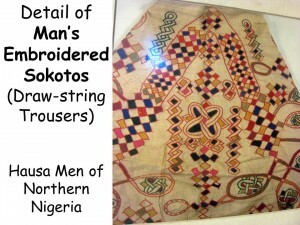 The traditional pattern of this cloth is now widely copied by women weavers from other areas of Nigeria. 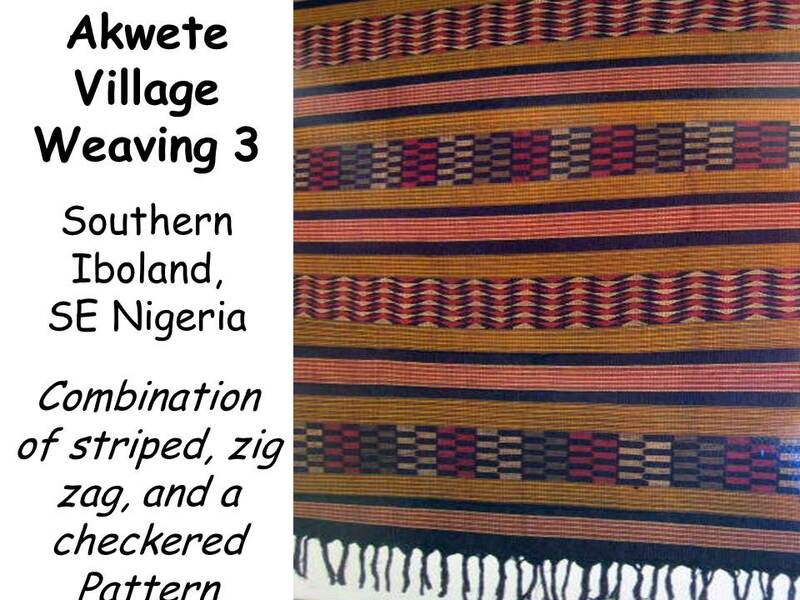 However, Akwete weavers probably learned many of their designs and techniques from Yoruba weavers of the town of Ijebu, where similar cloths were woven in three sections before being sewn together. These cloths created on an upright loom are sometimes over four feet wide. 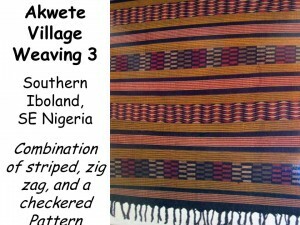 A characteristic feature of Akwete cloth is that one end is wider than the other end. 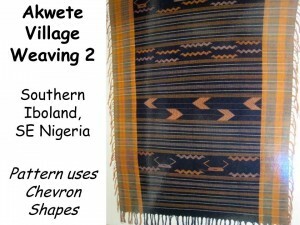 There is a debate whether this is an intentional feature or simply a natural result of the Akwete technique of weaving. 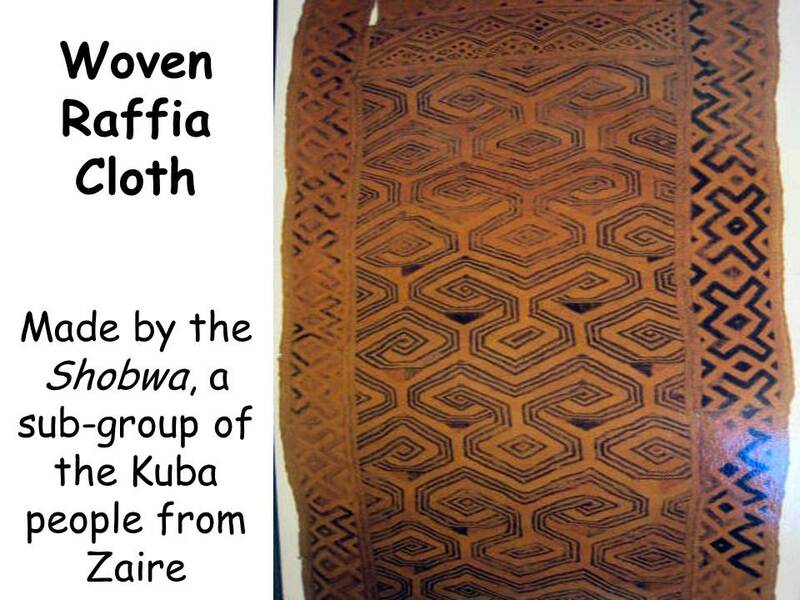 The Shobwa sub-group of the Kuba people of Zaire produced this cloth. 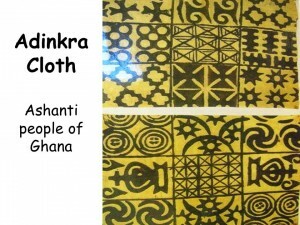 Yellow and black are usually the predominant colors of Shobwa cloths. The surface of Shobwa cloths are almost completely covered by large areas of soft, velvety “cut-pile”—this means the threads have been cut to stand up, much like velvet, terry cloth or corduroy. Many of the lines in this type of cloth are embroidered. Raffia is a grass like plant. When it dries it is a light color and somewhat stiff. MOVEMENT is created as our eyes follow the triple LINES all around the center PATTERN as we try to figure out if this is a geometric shape. This pattern is not really a shape at all, just a lot of moving LINES. 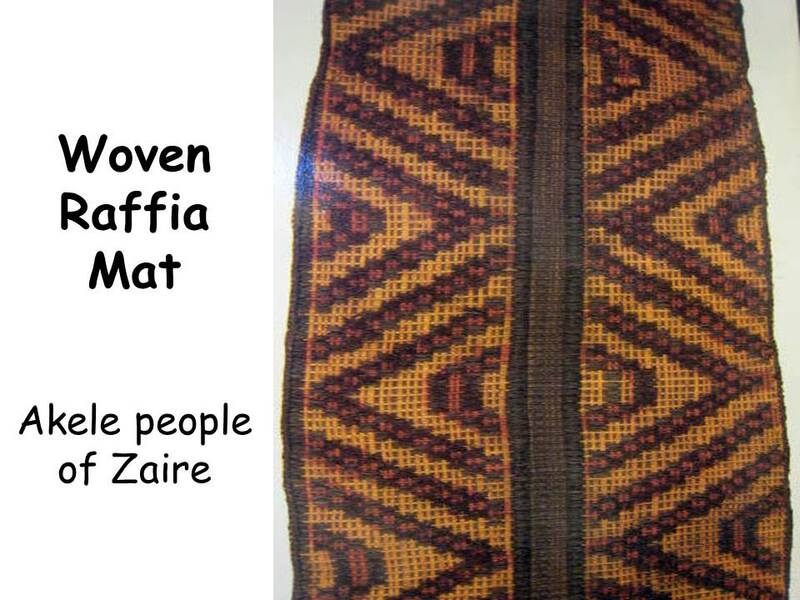 The Akela people of Zaire wove this raffia mat in the late 1800’s. Raffia is a good type of material for a mat. It is thicker and heavier than thread, so it will stay in place easier and will not wear out as fast. You might like to bring in a sample of raffia, a sample of yarn and a sample of heavy thread or string to let the kids compare. 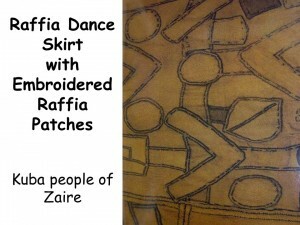 This is a close up of a portion (or detail) of a raffia dance skirt from the Kuba people of Zaire. The design shapes on this fabric are made from patches of raffia cloth, embroidered on raffia cloth underneath. 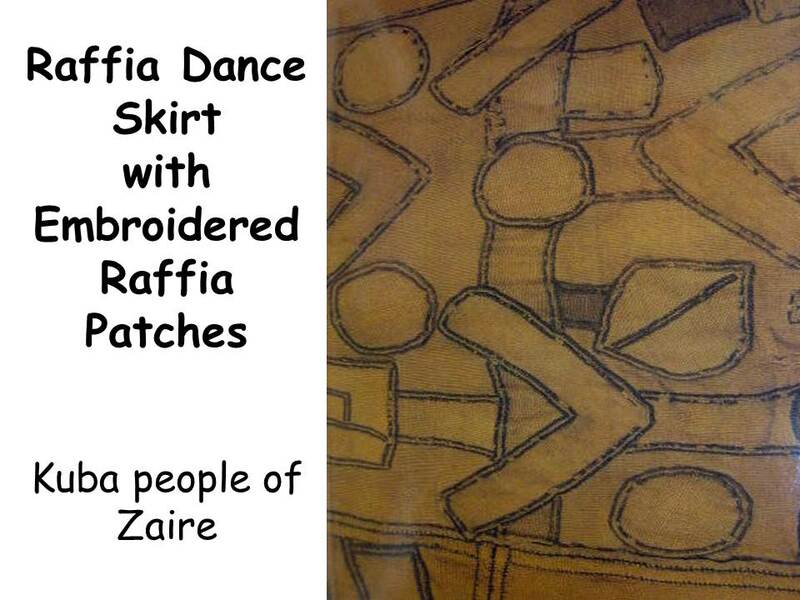 Originally, patching was done to repair tears in plain raffia cloths. The Kuba then realized the design potential of this idea and began to use it as a decorative pattern. The comma-shaped design on this cloth is called shinna mbo (“the tail of a dog”). 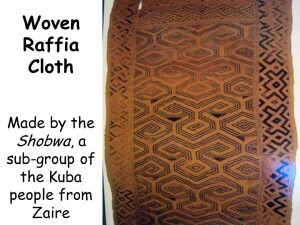 Older raffia cloths have just a few patches but in more recent examples (such as this), the pattern has grown and multiplied into a mass of interlocked designs. What do you notice about the color of this piece of fabric? It seems to be mostly the same color. 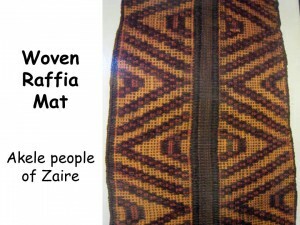 The patches sewn on this raffia cloth were made from the same type of cloth. Do you see any ORGANIC SHAPES? The shape called “tail of a dog” has an organic name but it is an ABSTRACT SHAPE (We would not recognize it as a dog’s tail except that we have been told the name of the SHAPE.) It is the CHEVRON (or angled or arrow type) SHAPE. • Sew designs on squares of muslin using yarn and burlap. Use a running stitch to create GEOMETRIC SHAPED designs—circles, triangles, squares, rectangles. Sew a shinna mbo (“The tail of a dog”) design on the cloth. 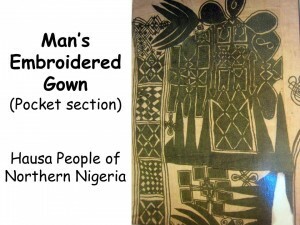 This is just the pocket section of a man’s gown of the Hausa people of northern Nigeria. The narrow strip cotton cloth is sewn together to make a wider piece of fabric. Then a design specialist paints the design on the cloth. This usually takes a few hours. Next, an embroiderer stitches the design with imported European knitting wool, which can take several weeks to complete. The overall pattern is known as aska takwas (eight knives). The eight triangle patterns in the design represent the pattern’s name. The openwork in the pattern, achieved by eyelet infilling, is described as “a thousand ant holes”. Can you find the “ant holes”? You need to look closely at the texture of the patterns. You may wish to have them come up to the front and take a closer look. Where do you see CURVED LINE? A man’s gown would be worn like a shirt except that it would come down below his knees or to his shins. Underneath his gown, he would also wear pants or trousers. The Hausa people call the gown a DASHIKE (dah sheeky). Yoruba men also wear a gown in this style called an AGBADA (ahg BAH DAH). This picture shows the detail of the embroidered area on a pair of wide-waisted, drawstring trousers. Men of the Hausa people of northern Nigeria wear this type of pant. Men do the embroidery with European knitting wool on narrow strip cotton cloth. The embroidery on the pants has many colors while the embroidery on a man’s gown is only one color. Curiously enough, the trousers would rarely be seen as the gown would cover them unless the wearer was on horseback. The large “knot” design in the center of the cloth is repeated many times in the design. This design is borrowed from the Islamic culture. Can you see the stitching lines where the narrow strips of fabric have been sewn together? Where do you see ZIG ZAG LINE? How many “knot” design SHAPES can you find on this cloth, besides the large centered one? • Give kids pieces of muslin or a solid color sheet cut up in a square or a rectangle. Using several colors of embroidery floss, teach kids how to embroider using an outline stitch or a satin stitch. Have them first draw their design on the cloth with pencil. A cotton cloth from Guinea Bissau woven of machine-spun yarn. (Machine spun yarn is narrower than home-spun yarn and creates a finer, smoother cloth) These are very complex designs. This cloth is slightly different looking than are other examples. It is one of the few examples of European influence on the design of African textiles. The Portuguese probably introduced these patterns to these weavers of West Africa, whom they took as slaves to the Cape Verde Islands, during the 1500’s. 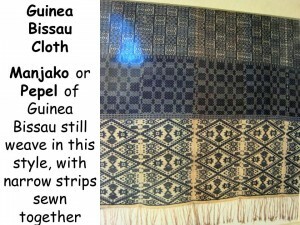 This style of weaving is still practiced by the Manjako and Pepel peoples of Guinea-Bissau. No one living on the Cape Verde Islands, today, weaves this way anymore. Can you find the seam lines that hold the narrow strips of cloth together? Describe the three distinct PATTERNS of this cloth. This is an old cloth, thought to be from Ghana, though it displays some of the characteristics associated with Manjako weaving from Guinea-Bissau. Its true origin still remains a mystery! 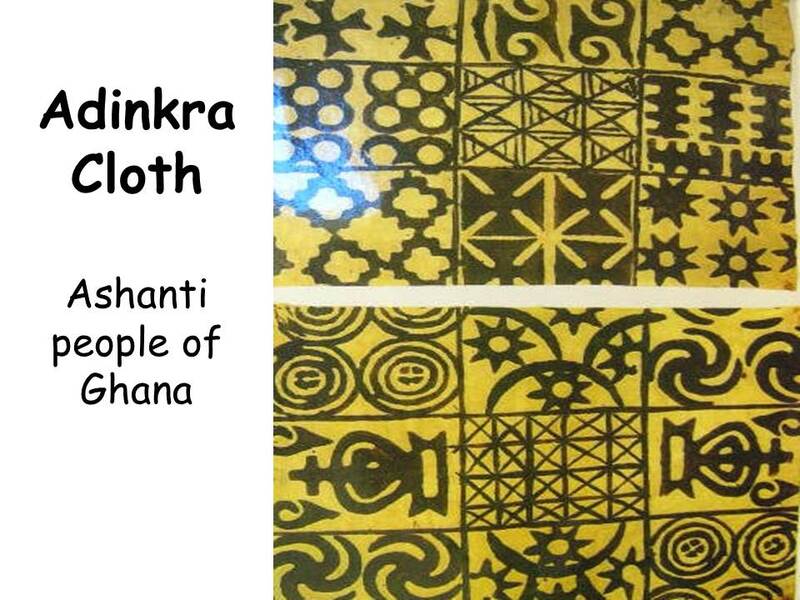 In African Ghana, Ashanti royalty wore Adinkra cloth as robes of mourning. 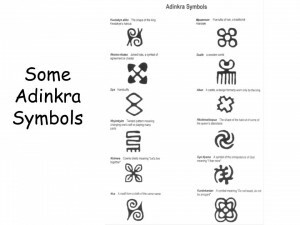 “Adinkra” means “good-bye” in Ghana. Today, the general public wears Adinkra cloth for everyday occasions. The cloth is printed with motifs (or patterns) symbolizing allegorical, historical or magical significance. Everyday objects are also represented in the beautifully decorative and symbolic stamp designs. Traditional use of the cloth used one symbol to convey a particular meaning. A king wanting to show that he was fearless and independent would wear a cloth of the “aya” or fern design. Contemporary cloths combine many symbols in one cloth. The designs printed on the cloth are usually symbolic of stories, history or they have some kind of magical meaning. Funerals in Ghana are not sad affairs; they are more like family reunions when relatives from all over the country come together in celebration of the end of life on earth and the beginning of the spirit life. Everyone shares the expenses of the singing, drumming, dancing and feasting that occurs. Traditionally, Ghanaians wear clothing made from rusty red and black Adinkra cloth. Artists in Ghana carve their stamps from Calabash (type of African gourd). A black dye is made from the bark of a tree. The rusty-colored cloth is stretched out on the ground with pegs. 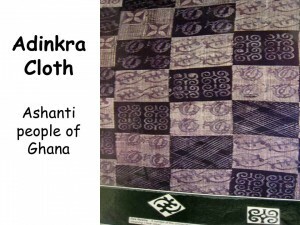 Children as young as seven help with Adinkra cloth. Colors for the cloth originally were red or brown, symbolizing mourning cloths. 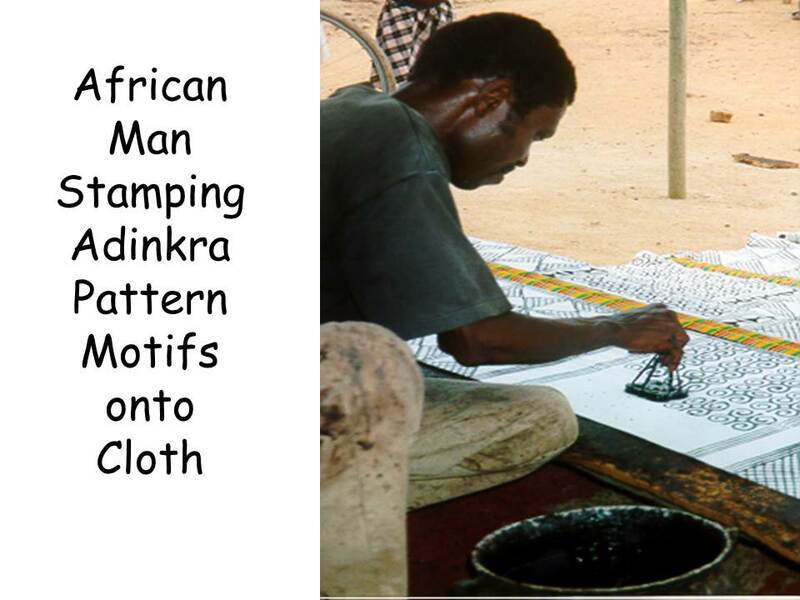 Today, Adinkra cloth is made from long strips of white or bright-colored cloth and stitched together with embroidered stripes of red, yellow, green and black. Today, all colors are used, each representing a particular meaning. 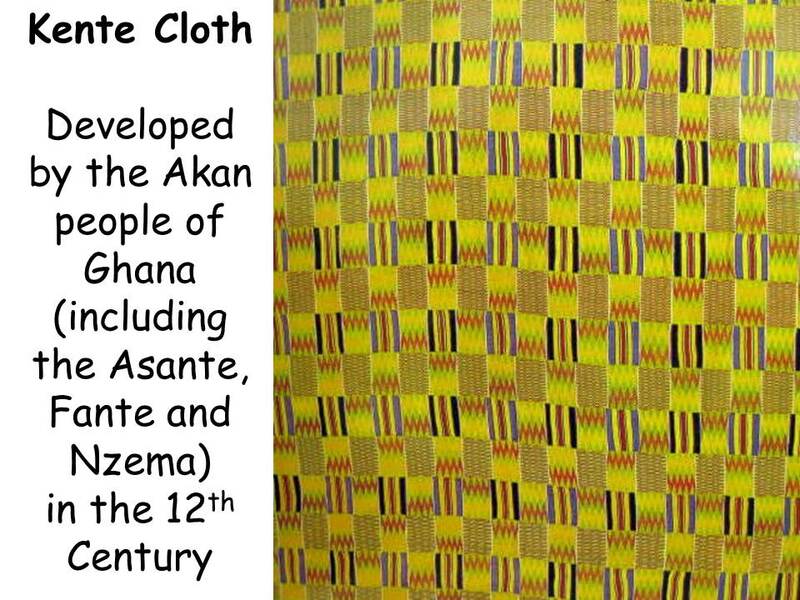 “Kente cloth” is produced by the Akan people (including the Asante, Fante and Nzema) of Ghana, where it was first developed in the 12th century. Kente is also produced by Akan groups in the African country of Cote d’Ivoire, such as the Baoule and Anyin people who trace their ancestry back to Ghana. 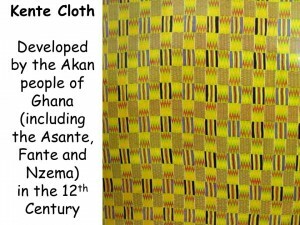 It is a royal and sacred cloth worn only in times of extreme importance and is the best known of all African textiles. Kente was the cloth of kings. Over time, the use of kente became more widespread across Africa, however its importance has remained and it is held in high esteem in the Akan family and the entire country of Ghana. Kente comes from the word kenten, which means “basket.” The Asante peoples refer to kente as Nwentoma or “woven cloth”. 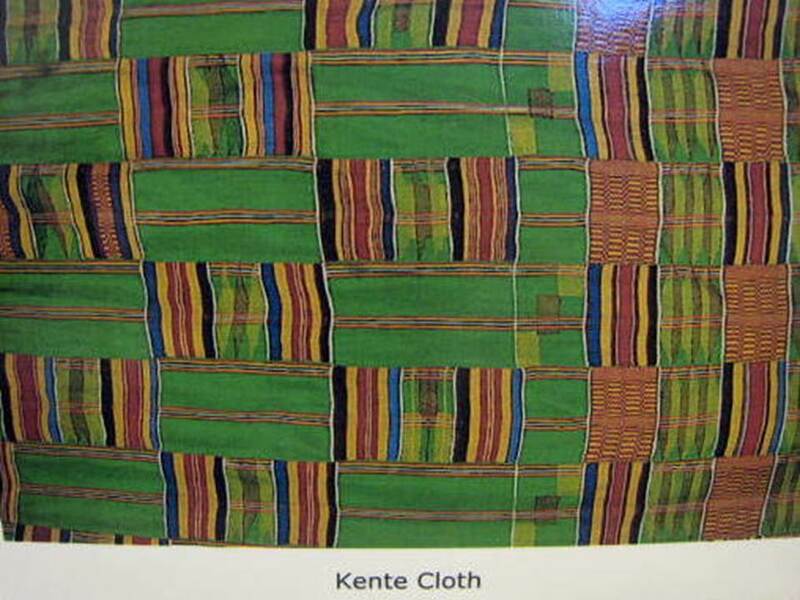 Legend says that kente was first made by two friends who went hunting in a forest and found a spider making its web. The friends stood and watched the spider for two days then returned home and implemented what they had seen. 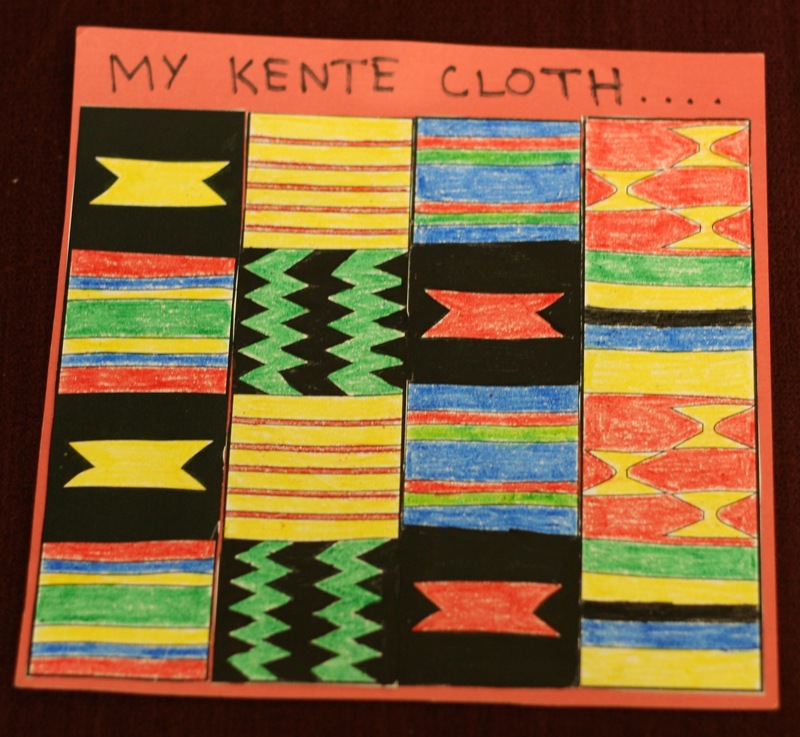 Does this example of Kente cloth have more WARM COLORS or more COOL COLORS in the PATTERN? 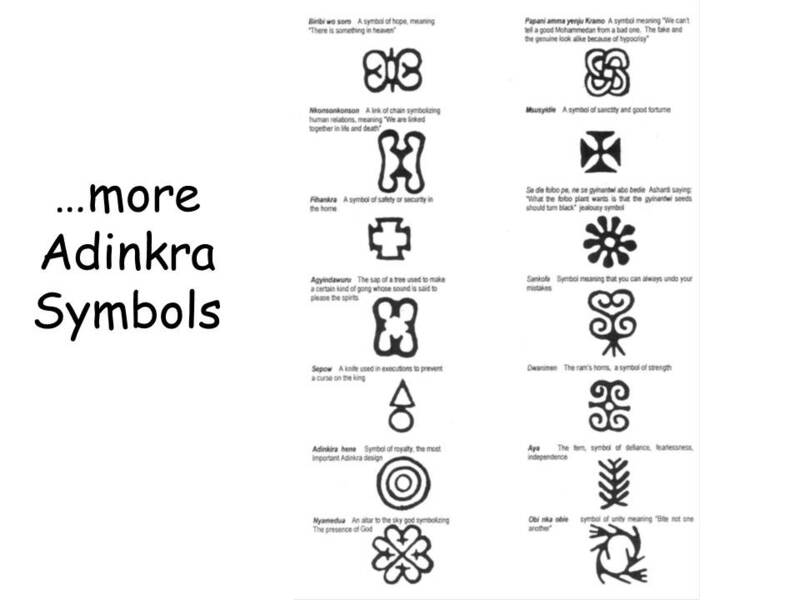 • Tag board is great for kids to cut stencils of the real Adinkra design symbols. They could each cut one stencil and share the stencils so they could have several SHAPES to create PATTERN on their cloth or construction paper. Cloth does not have to be used for the projects in this packet. Construction paper works fine—especially the larger sheets. Cloth just gives the kids a chance to try another medium and, if your school has an Art Discovery budget, you can buy inexpensive muslin or old solid color sheets (check secondhand stores and garage sales). You might find parents in the school willing to donate plain fabric or sheeting if you ask. 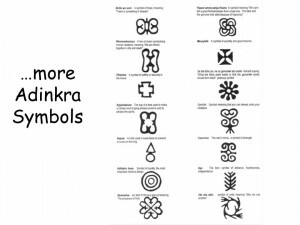 • Kids could create foam stamps with Adinkra cloth design symbols. Stamps could then by used to print a square or rectangle of either a paper or cloth Adinkra PATTERN. Each square usually has more than one PATTERN so it would be nice for kids to share their stamps. • Make a class Banner. Use a large strip of fabric and let each of the kids dip their hand in paint and print it on the banner. You could use different colors of paint (warm?, cool?, Primary?). If make a class banner the teacher could hang in the room, but want kids to have something of their own to take home, you might consider having them make and use stamps on the banner. There are several suggestions, included in this packet, for making stamps. 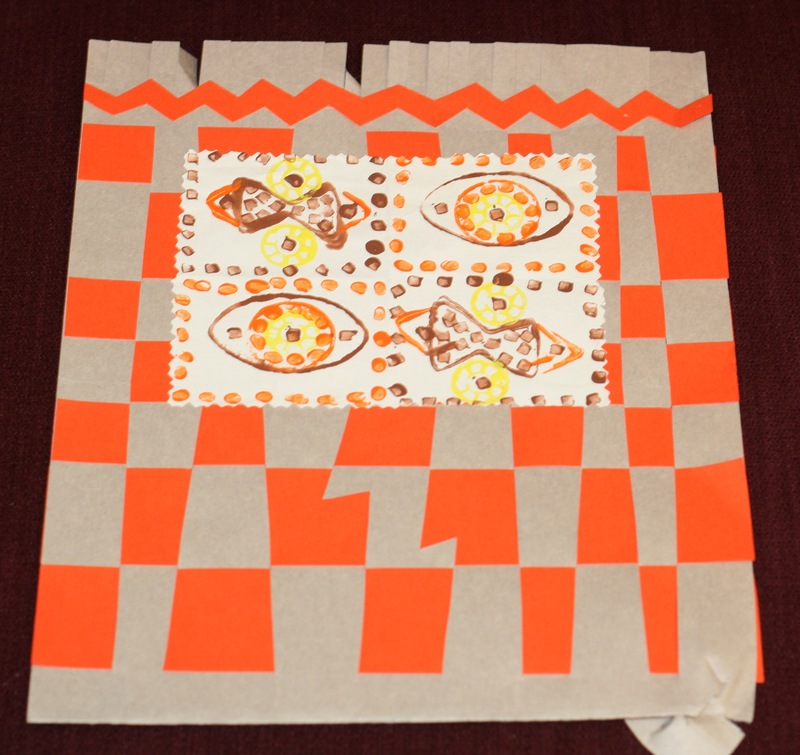 Kids could then take the stamps home and create more pattern designs on their own. • A weaving project could be done on a square of corrugated cardboard. Notch the opposite sides, on the outside edge of the cardboard, and space them out evenly. Wrap yarn around the cardboard using the notches to hold it in place. Use yarn and/or strips of fabric to weave between the first yarns wrapped over the cardboard. Kids could create small pot holders this way. You may be interested in creating a West African food, instead of an art project, this month. This recipe is from Ghana. You will need to bring in an electric skillet and a food processor. Be sure to set up the plan for this activity ahead of time with the classroom teacher. You will want to start warming the oil just as you finish your presentation, in order for it to be hot when you finish mixing the recipe with the kids. I doubled the recipe and called on assistant parents to help with the food preparation. Cut the onion ahead of time and bring it in a covered container. I asked two students to scoop it into the processor with plastic spoons. I brought plastic knives and a cutting board for four helpers to cut the plantain into chunks. If you have additional cutting boards, you could cut the plantain in half (bring a sharp knife for yourself) and use eight assistants. I used a different assistant to scoop each of the ¼ teaspoons of ingredients (I doubled the recipe). One student measured and placed ¼ teaspoon of baking powder into the food processor and a different student measured and placed the second ¼ teaspoon of baking powder. It took a little longer this way but more of the kids were able to participate. Place all ingredients into a food processor and process in short bursts until the mixture is well blended. Drop by spoonfuls into hot oil and fry until golden brown on both sides. Serve on a napkin or paper towel. Caution kids to let the cake cool some before biting into it. Use small spoonfuls so these will cook faster and because many kids will not try more than a biteful. Share the excess with those who like to try new things after each student has had a small cake.